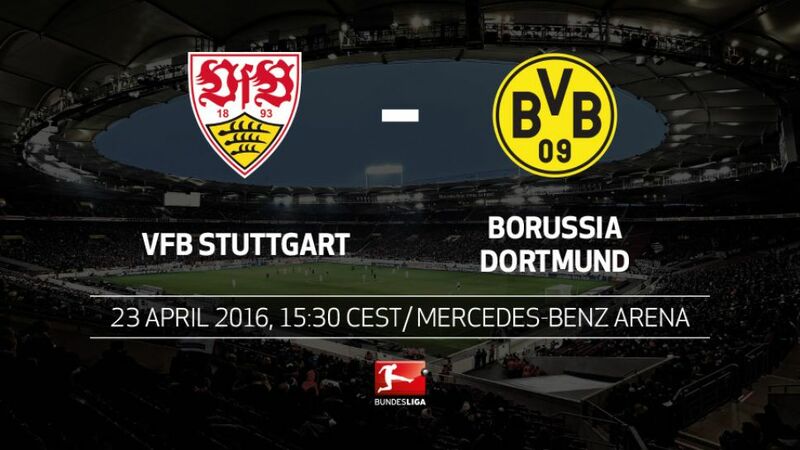 Survival hopes and title aspirations are on the line as VFB Stuttgart welcome Borussia Dortmund to the Mercedes-Benz Arena on Saturday afternoon (kick-off 15:30CEST/13:30GMT). VfB Stuttgart, having taken 15 points from their first five matches of the Rückrunde, have endured a capitulation since. Saturday's 1-0 loss at FC Augsburg left Jürgen Kramny's side just three points better off than SV Werder Bremen in the promotion/relegation play-off spot. The Swabians have dropped 13 points in their last five games, and could find themselves in the relegation places after Matchday 31 having been 11th as recently as Matchday 27. Borussia Dortmund promise not to be the easiest team to rebound against, though. Die Schwarzgelben are hoping to keep their diminishing title hopes alive, and to do so they must avoid defeat at the Mercedez-Benz Arena. If they lose and FC Bayern München win at Hertha Berlin, the Bavarians will secure their fourth consecutive Bundesliga title. Following last Sunday's 3-0 win over Hamburger SV, Thomas Tuchel's side are seven points behind the leaders with nine left to play for after this weekend. Stuttgart have been the weakest team in the Bundesliga over the last five matchdays, dropping 13 points and conceding 11 goals in that time.Stuttgart's last win over Dortmund came back in January 2010. Dortmund are undefeated in 11 games against the Swabians since. No team has waited longer for a win over BVB.Dortmund have won each if their last four visits to Stuttgart, including this season's DFB Cup quarter-final, in which Thomas Tuchel's side prevailed 3-1.This is the first time since Matchday 21 that Dortmund have played on a Saturday afternoon.The reverse fixture was Stuttgart coach Kramny's Bundesliga debut. Kramny is the first Stuttgart coach ever to begin his tenure with a loss greater than two goals.Gonzalo Castro's third-minute opener for BVB in that game remains the fastest goal Stuttgart have ever conceded in the Bundesliga.Christian Pulisic became this season's youngest Bundesliga goalscorer when he found the target in Sunday's 3-0 win over Hamburger SV aged 17 years and 212 days.Aubameyang has scored five goals in five Bundesliga games against Stuttgart.Henrikh Mkhitaryan has scored four Bundesliga goals against Stuttgart, with BVB winning each time.